If your child is in a cast… is a little (or a lot) glum and grumpy…here’s a terrific cheer-up book! 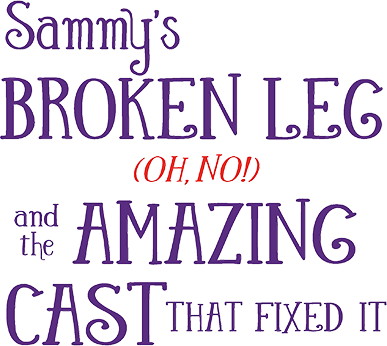 It’s a whimsical story that’s serious fun for kids with a broken arm or leg or hip dysplasia. For young children recovering from the physical and emotional upset of life interrupted by a cast. The book walks you through and helps ease the anxiety of the real-life events that happen during Sammy’s hospital visit and beyond. 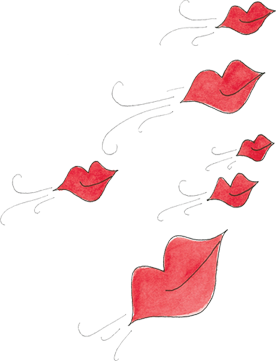 The surprise kisses are a brilliant and whimsical way to portray all of Sammy’s get-well wishes, thoughts and prayers. They are Sammy’s reminders of how much she is loved. I like the way the story moves toward recovery and wellness. 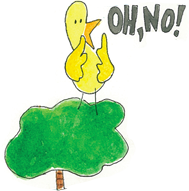 The book helps kids struggling with a physical condition and tells them they aren’t alone. As a pediatrician, I think this story about dealing with a [cumbersome] cast is just right. It is very nicely done. Comforting, sweet story…captures the feelings of the whole family. It realistically portrays the patience needed before a child is restored to full activity. This is a loving story that educates, encourages and entertains. 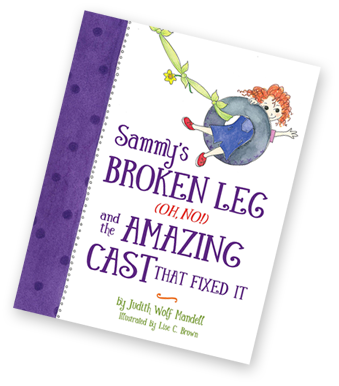 A loving, sweet story of a little girl’s broken leg and recovery that is informative and medically accurate. Gives children and their families realistic expectations about recovery. Gives children a secret source of patience and power over their circumstance.